Of the three collinear libration points of the Sun–Earth Circular Restricted Three-Body Problem (CR3BP), L3 is that located opposite to the Earth with respect to the Sun and approximately at the same heliocentric distance. Whereas several space missions have been launched to the other two collinear equilibrium points, i.e., L1 and L2, taking advantage of their dynamical and geometrical characteristics, the region around L3 is so far unexploited. This is essentially due to the severe communication limitations caused by the distant and permanent opposition to the Earth, and by the gravitational perturbations mainly induced by Jupiter and the close passages of Venus, whose effects are more important than those due to the Earth. However, the adoption of a suitable periodic orbit around L3 to ensure the necessary communication links with the Earth, or the connection with one or more relay satellites located at L4 or L5, and the simultaneous design of an appropriate station keeping-strategy, would make it possible to perform valuable fundamental physics and astrophysics investigations from this location. Such an opportunity leads to the need of studying the ways to transfer a spacecraft (s/c) from the Earth’s vicinity to L3. 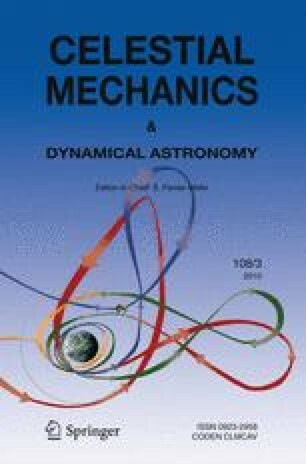 In this contribution, we investigate several trajectory design methods to accomplish such a transfer, i.e., various types of two-burn impulsive trajectories in a Sun-s/c two-body model, a patched conics strategy exploiting the gravity assist of the nearby planets, an approach based on traveling on invariant manifolds of periodic orbits in the Sun–Earth CR3BP, and finally a low-thrust transfer. We examine advantages and drawbacks, and we estimate the propellant budget and time of flight requirements of each.